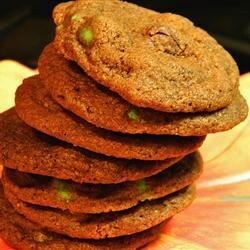 "Tender cookies with milk chocolate chips and peppermint extract." Preheat oven to 350 degrees F (175 degrees C). Grease cookie sheets. Stir together the all-purpose flour, whole wheat flour, cocoa powder, dry milk, baking soda and salt; set aside. In a large bowl, cream together the butter, vegetable oil, brown sugar and white sugar until smooth. Beat in the eggs one at a time then stir in the vanilla and peppermint extracts. Gradually stir in the dry ingredients using a wooden spoon. Finally, fold in the milk chocolate chips. Drop by rounded spoonfuls onto the prepared cookie sheets. Bake your favorite thin chocolate mints into these melt-in-your-mouth cookies. These cookies turned out perfectly - I think they are the best cookies I ever made. Just the right amount of peppermint, although I didn't think it would be enough.